Born in Belfast, Northern Ireland, and now living in England, Claire Morgan uses organic materials and taxidermy to create intricate sculptures, hanging installations, and works on paper that explore the impermanence, complexity, and fragility of life forms. Her interest in natural processes and the physicality of animals is seen through her works, which capture both the elegance and beauty of life and the senselessness and shock of death. During this event, in conjunction with her first American solo exhibition, Morgan discusses her sources of inspiration, artistic practice, and body of work. 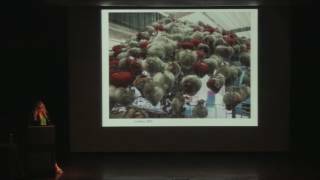 This lecture was presented at the Frist Art Museum on February 10, 2017 in conjunction with the exhibition Claire Morgan: Stop Me Feeling, on view at the Frist from February 10 through May 7, 2017.